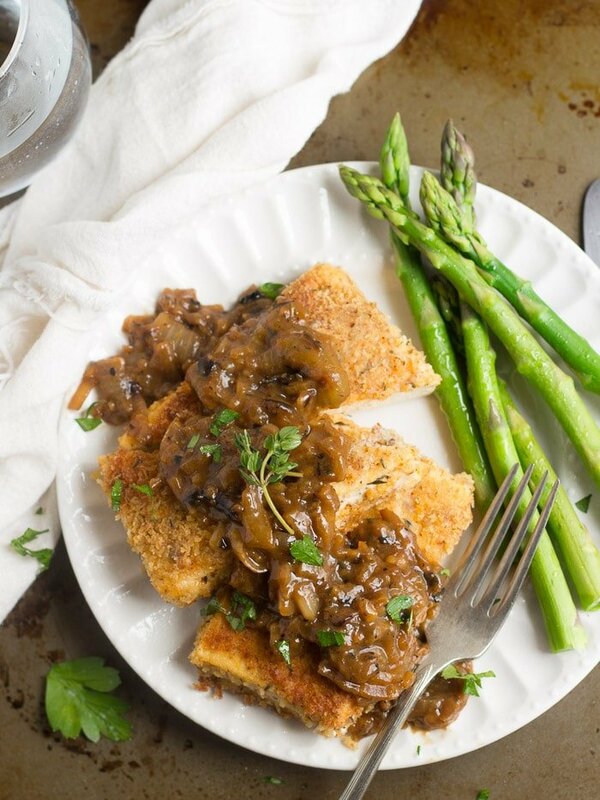 These tofu steaks are covered in a crispy seasoned panko mixture and served with rich and savory caramelized onion gravy. I’m a planner. Usually, when I have plans to work on a recipe, I get all the ingredients a day or so in advance, so that in the next day I’m all ready to start cooking right away and snapping photos of my food in the perfect morning sunlight. But it never really happens like that. In fact, some days I make three or four trips to the supermarket, because I always forget something. Fortunately, I have a store that’s a half a mile down the street, so not a huge deal. The employees know me, but they don’t know what I do for a living, because that can get a little weird when I try to explain it to people. (“I post recipes on the internet for a living” usually ends up leading to a long discussion!) But some days, on my third or fourth trip, I’ll get a cashier who’s all “You really like this place, huh?” I just tell them I like to cook a lot, which hey, is true! So I intended to make some crispy tofu steaks with mushroom gravy, when I realized that I totally forgot to buy mushrooms. It was cold out and I just couldn’t muster the energy to run out to the store one more time for a measly pack of mushrooms, and inspiration hit: I could make caramelized onion gravy! Also, this was kind of fortunate, because I have kind of bombarded you guys with mushroom recipes this year, and I haven’t given caramelized onions nearly enough love. My husband commented that this was the best steak dinner he’s ever had. I’m with him on that, but you might want to take his word over mine—I think I’ve had a total of three steak dinners ever, including cauliflower steaks. While the tofu presses, place the olive oil, onion, thyme, and sugar into a medium skillet and place it over medium-low heat. Allow to cook, flipping occasionally, until the onions begin to brown and caramelize, about 30 minutes. Add the wine, raise the heat to medium, bring to a simmer, and allow to cook until most of the liquid has cooked off, about 3 minutes. Stir in the flour to form a paste coating the onion. Stir in the broth and soy sauce. Bring the mixture to a simmer and allow to cook until it becomes nice and thick, about 5 minutes. It gets thick quickly, so add in some additional water if it becomes too thick. Taste test and add more soy sauce if you'd like. In a shallow dish, whisk together the batter ingredients. Allow the mixture to sit for about 10 minutes, until it thickens up. In a separate dish, stir together the ingredients for the panko coating. Cut the tofu in half width-wise, then cut each piece in half thickness wise, creating 4 slabs. Very generously coat the bottom of a large skillet with oil and place it over medium heat. 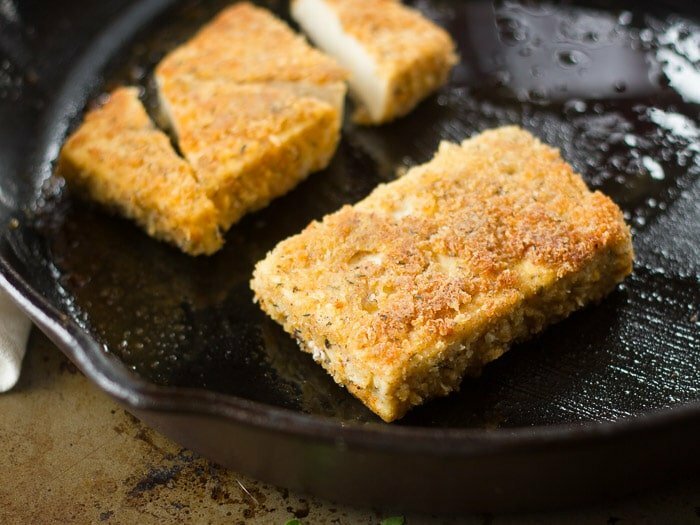 When the oil is hot, place one of the tofu slabs into the batter, flipping to coat each side, then transfer it to the panko mixture and coat each side. Place it into the skillet, and repeat for the remaining tofu slabs. Cook each for about 4 minutes per side, until golden brown, very carefully flipping between sides so as not to remove the coating. 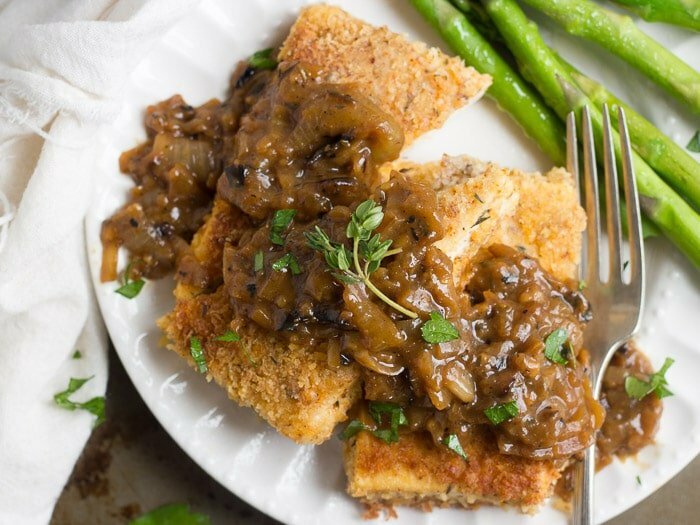 Divide the tofu steaks onto plates and top with caramelized onion gravy. Serve. This recipe only makes a small amount of gravy, but like I said above, you only need a little. If you're a serious gravy monster, make a double batch. *Be sure to press the tofu for a minimum of 15 minutes, but with this recipe, the longer the better. I wrapped mine up in some towels and topped it with a couple of books early in the day, then let it sit for a couple of hours before cooking. **Is it weird that I included a garlic clove in the batter? Maybe. I intended to include garlic powder in the panko coating, but that's another ingredient I forgot to buy. The fresh garlic version tasted great, but feel free to skip it and instead include 1/4 teaspoon of garlic powder in the panko mix. How do you think the tofu steaks would do in an air fryer? I bought one so I can make crispy tofu without the oil. I wish I could say! I’ve never used an air-fryer, but I’m dying to give one a try. I have heard from readers who have gotten similar recipes to work in an air-fryer, so based on that I think it could work. I’d love to hear how it works if you do give it a try! Thanks for your response, and I will let you know! Made these last night for dinner and they were great (and my meat loving partner agreed)! I love learning new ways to use tofu. Thanks for the recipe! 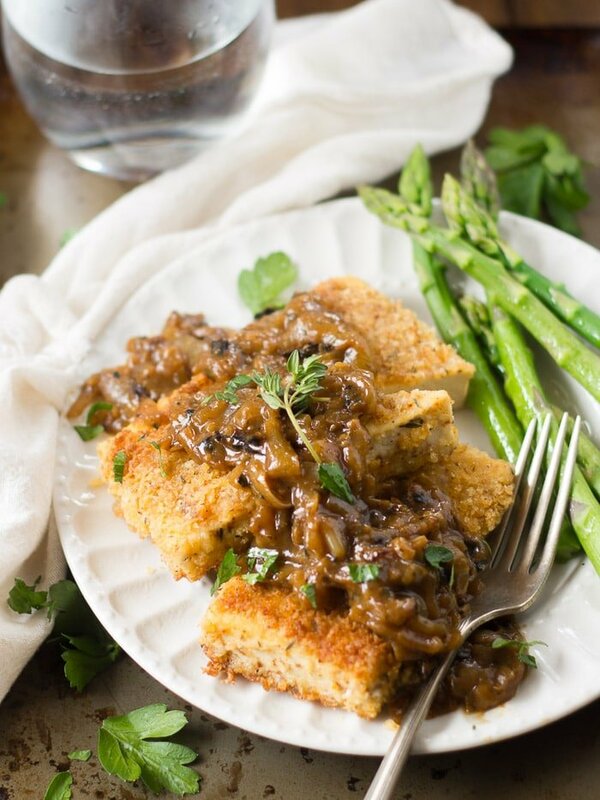 Made these tonight – everyone around the table were amazed they could enjoy tofu so much! Two eleven year-old boys insist this be on our regular menu of meals! I made these tonight with mashed potatoes like you suggested and they were excellent! Thanks for a great recipe! You are so welcome! These go great with mashed! Thank you for posting this recipe! We have a guest coming for Thanksgiving who is vegan AND does not consume gluten or alcohol. I want to make him something delicious, so I’ve been scouring the inter-webs for recipes. Yours fits the bill. I set up a test run substituting gluten-free flour and gluten-free Panko crumbs, and then used white grape juice with a splash of lemon as a substitute for the wine in the gravy. Turned out very nicely! I was a little skeptical the tofu would hold onto the batter when dipped, so I dredged it in gluten-free flour first. Looking forward to making this again in November. Yay!! I’m glad to hear it worked out! Thanks Kate!! We have made this recipe a lot — and I mean A LOT. The tofu steak itself has become a staple in our house. It’s great on its own, it’s great with the gravy and mashed, it’s great in a sandwich, it’s great in smaller sizes as sweet and sour tofu… There’s really no limit to what you can do with it. It was a game changer for us, so THANK YOU! Instead of mashed potatoes, steam a head of cauliflower with a few garlic cloves. Mash with some vegan butter. Minimal carbs but awesome. I make a red pepper sauce to tie it all up.